In the next month or so, Mustapick Estate Homes will finish its new Somerset model in the Isle Estates, a residence with a wonderful Great Room design made for entertaining. The builder has enjoyed great success in Old Palm Golf Club with designs of this nature, and the Somerset may well be the finest example yet of this popular style. Even the approach is stunning, as two fountains flank the entryway near the four-car garage. Inside, there is plenty of space for residents and guests. With 4,316 square feet under air, the Somerset easily accommodates four bedrooms, four full land two half baths, and a spacious club room. Still, homebuyers find the Great Room at the heart of the home the most irresistible feature. It opens onto the kitchen and dining room, creating a large airy space with high volume ceilings that is further enhanced by the natural light from the abundant windows and doors. 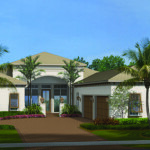 Beyond the Great Room lies a covered loggia with a fireplace and room for plenty of seating and an outdoor kitchen. The view is of Old Palmâs spectacular Raymond Floyd-designed golf course. âWalk in the Somerset and itâs easy to picture friends and family gathered around the Great Room, enjoying the comfort of this remarkable home,â says Connie McGinnis, Director of Sales. âEntertaining just comes naturally in this sort of environment, and I have no doubt that the Somerset will be snapped up long before the season is over.â The Somerset is priced starting at $2,795,000.